Like most people, I’m always trying to maximize my time. I don’t like wasting time while I’m waiting at a doctor’s office or even standing in line at the grocery store. You probably do this too: Almost unconsciously, I’ll start checking my social media feeds when I’m waiting for something or someone. But you know what? Instead of just killing time, I could actually be doing something productive and more valuable than spending time on social media. I could actually be building a personal relationship with Emmanuel, the child I sponsor in Kenya. I could be writing to him and learning more about his family or even his community. As a sponsor I want to connect with Emmanuel. But my biggest reason for not writing him is that I just don’t feel like I have the time to sit down and get comfortable and write a letter. The thing is, I know I’m not alone in that feeling. Actually, we’ve heard similar comments from lots and lots of sponsors. 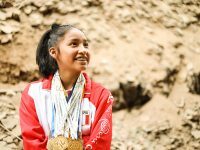 You all have told us you want to write to the kids you sponsor more often and need a little help to do so. Well … we heard you! And we have made it easier than ever to connect with the children you are investing in. 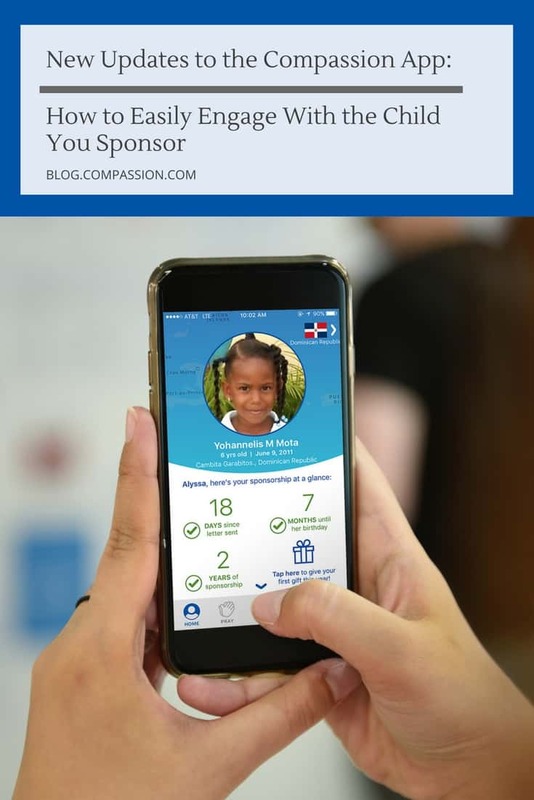 The newest version of the Compassion mobile app is available for iPhone and Andriod. And it allows you to take your sponsorship on the go … wherever you go! The new dashboard on the app makes it super easy for you to see all the info about your sponsorship. 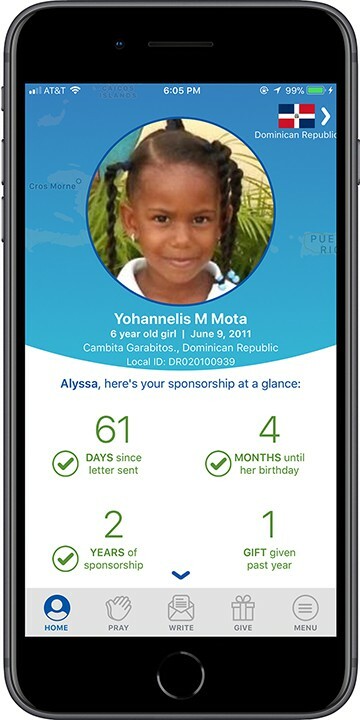 It includes your letter-writing stats and how many days are left till the birthday of the child you sponsor. It even includes what kind of gift-giving opportunities are available. Next, once you know the details, you probably want to be able to write quickly and easily. And you know what? You can! Well, why not share that experience with her and let her know that you’re thinking about her? Another feature we’re really excited about is the prayer section. 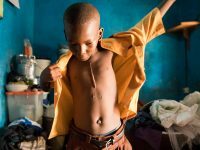 We know that prayer matters to the child you sponsor. We also know that sometimes it’s a little difficult to know how to pray for a child in a different country. Now you can go to the prayer section and find prayer points that will help you know exactly how to pray for him or her based on his or her age and country. Oh, and we heard loud and clear when you said that you love knowing the weather and time in his or her country. So we’ve made that very easy to see on the app. And you can see how far he or she is from you with our new map. I guess you can tell we are pretty excited about the new app! We can’t wait for you to get into it and discover how easy it is to stay connected with the child you’re investing in! Of course, this app is a work in progress. 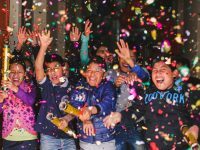 We commit to continue improving it for you and helping you build a relationship so that you can continue to change the world for the child you sponsor every single day! 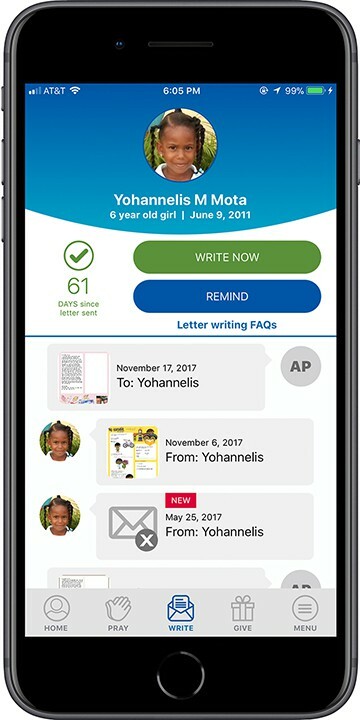 You can download the Compassion IOS app and Android app to maximize your time while growing closer with the child you sponsor across the world. 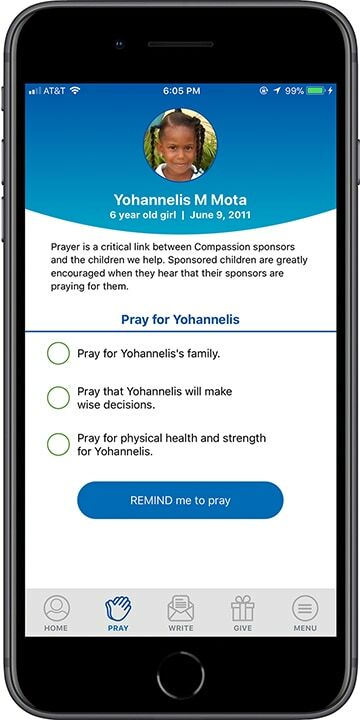 Have you used the Compassion app before? Do you like the new updates or have ideas for others? Let us know in the comments below! Krissy is an Engagement and Retention Manager for Compassion International. 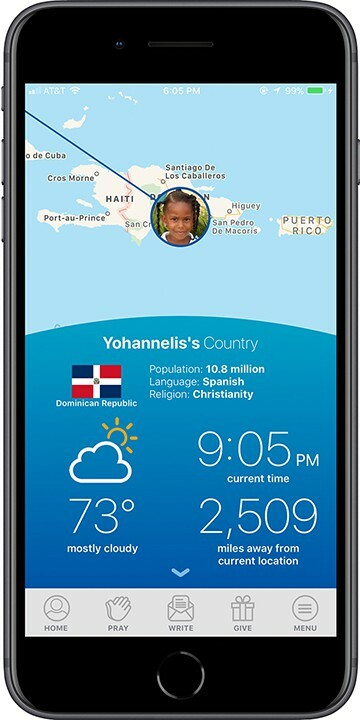 This blog was written in March of 2018 and back then we had not yet updated the Compassion app for Android. However, we do have that updated now and ready to go for you. You can download the newest version in the play store! Blessings! I miss the information about the child’s level in school and their cognitive age group. There was other information on the old ap that I liked – maybe things like who they lived with, family size, what they like to do, etc. I do like the new things, but I miss the old! Caryl, I’m so sorry to hear that you are not fully happy with the new mobile app and the information provided. Please know that if you do have any questions about your children, we would be happy to answer your questions privately to respect the child’s privacy. You are welcome to call us at 1-800-336-7676 or email at socialmedia@compassion.com. We are here to serve you Monday – Friday, 7:00 AM to 5:30 PM, Mountain Time. However, there is still a lot of information about your kiddos on the app; it’s just separated out a little differently at the bottom of each child’s profile page. For example, you can still find your child’s school grade, favorite subject, favorite things and activities, and their primary caregiver’s name. Please let us know if you have any additional questions or concerns. I hope this information was helpful! Have a blessed day! HOW DO I can to meet my sponsor? Hi Diego! 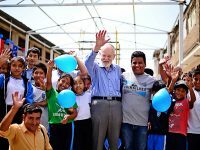 For more information about possibly contacting your sponsor, please email us at socialmedia@compassion.com. Thank you! Seria bueno que hubiese una versión de android, y que se pueda usar en cualquier pais. Estamos trabajando en una versión de Android que se lanzará más adelante en la primavera de 2018. Lamentamos que la aplicación solo esté disponible para los patrocinadores de EE. UU. En este momento. What about us android users for this new app? Hi Larry! We are already working on a new Android version of the app to be released later this spring. Stay tuned! This is great. How will I know when it’s available? Hi Naddy! We sill send out an email letting current app users know when the updated version is available. You will also see the changes when you log in to the app, if you already using it. The beginning of Spring is right around the corner and we anticipate it will be ready late Spring, so not too far away now. This looks amazing. I can’t for the Android version to come out. Wow. This is cool beyond belief. Thanks so much for providing this convenient way to maintain contact with the young boy I sponsor. These are great features! Would it also be possible to include local news in the child’s country? What a great idea, Sarah! We’ll be sure to take it into consideration!